Shrimp Cobb Salad - Underground Fitness Dun Laoghaire | Bray | Dublin & Wicklow - Personal Training, Group Training and Bootcamps. Cook bacon in a large nonstick skillet over medium heat until crisp and remove from the pan. Wipe pan clean with paper towels, coat with coconut oil and Increase heat to medium-high. Add shrimp Sprinkled with paprika and pepper to pan and cook 2 minutes on each side or until done. While the shrimp cooks, combine salt, juice, oil, and mustard in a large bowl, stirring with a whisk. Add lettuce and toss to coat. Arrange about 1 1/2 cups lettuce mixture on each plate. 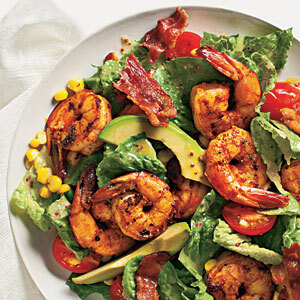 Top each serving with about 6 shrimp, 1/2 cup tomatoes, 1/4 cup carrot, 1/4 cup corn, 2 avocado wedges, and 2 bacon pieces.